I hate to say it, and maybe if I don’t, it won’t be true. But Summer is coming to an end. Where did it go? 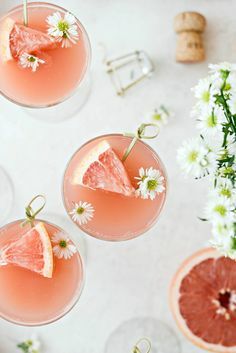 Did you enjoy it? I’m still trying to hold on to every last bit of the season that I can. When I think about it, I realize that I live in Arizona now where it’s hot around the clock and still quite summer-like, but the calendar tells me otherwise! I love a good popcorn snack. I mean, we dedicated a whole week to the stuff last year! 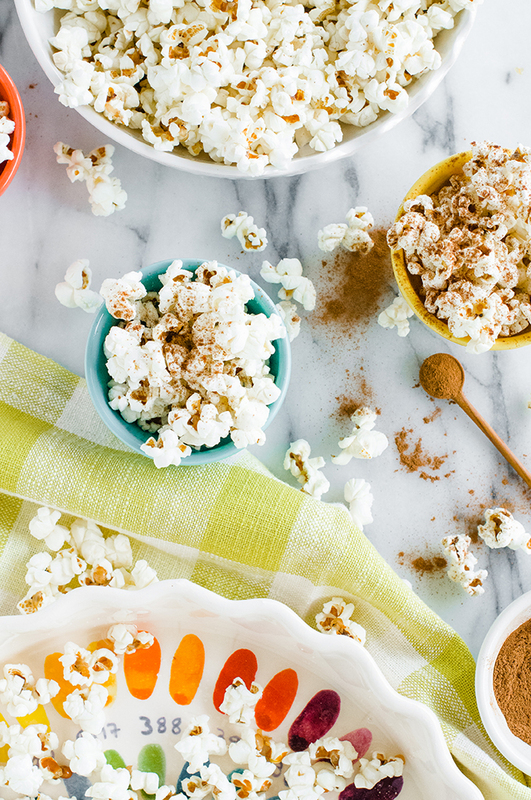 This coconut cinnamon popcorn can be added right up there with some of the other popcorn heroes! It’s good, people. It’s good people? Start by melting about 3/4 cup of coconut oil over medium/high heat in the bottom of a large stockpot. You may need more or less depending on the size of the pot, but a good rule of thumb is to have enough oil at the bottom to cover a single layer of popcorn kernels. 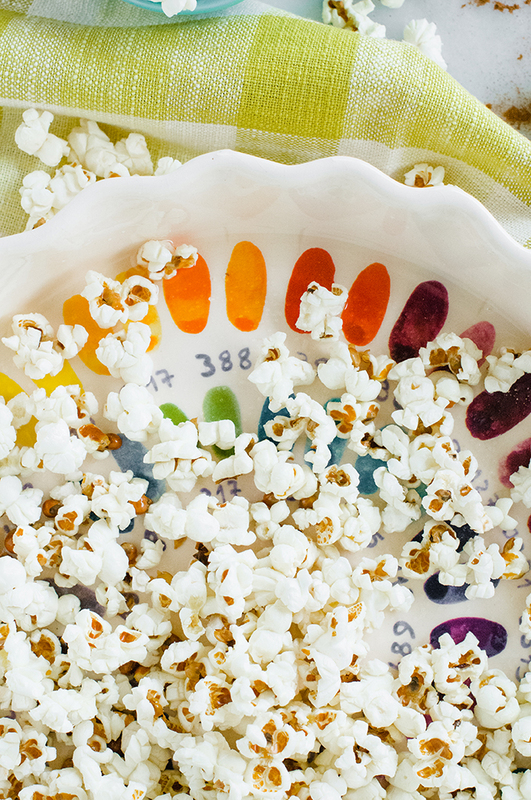 Once your oil is melted, pour in the kernels. 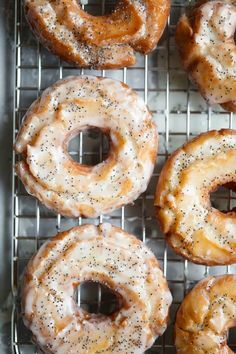 Spread them into a single layer and make sure they are just barely covered with the oil. If not, add a little more oil. It will melt instantly once it feels the heat! Cover the pot with a lid and wait a few minutes. 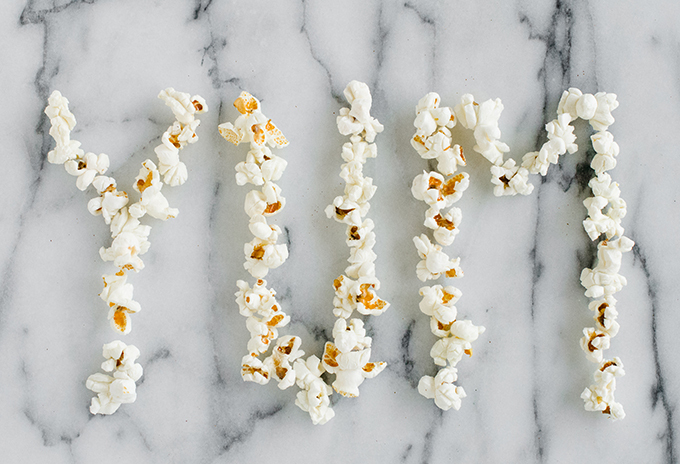 After about three minutes, the kernels should be popping something fierce. When this happens, shake the pot really quickly to loosen any kernels that might be sticking to the bottom and to also make sure every kernel is covered in coconut oil. 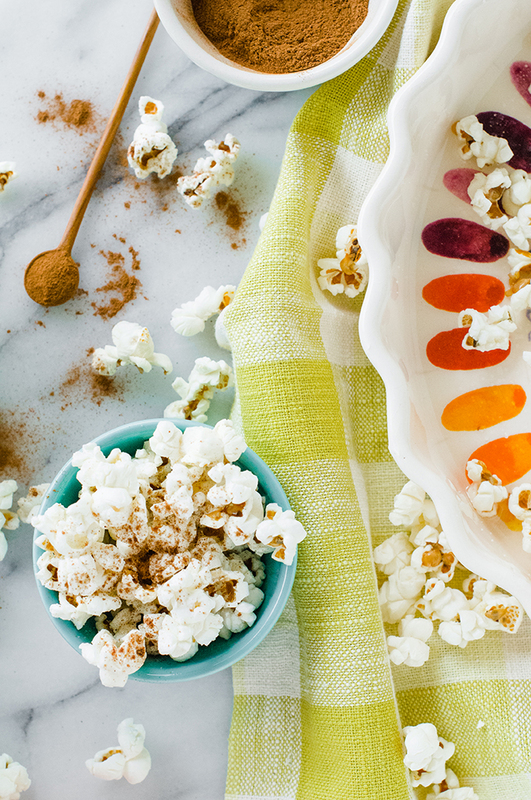 Once the kernels have slowed down to a few seconds between pops, remove the pot from the heat and wait one minute before pouring out into a bowl. Be careful! These suckers are hottie hot. 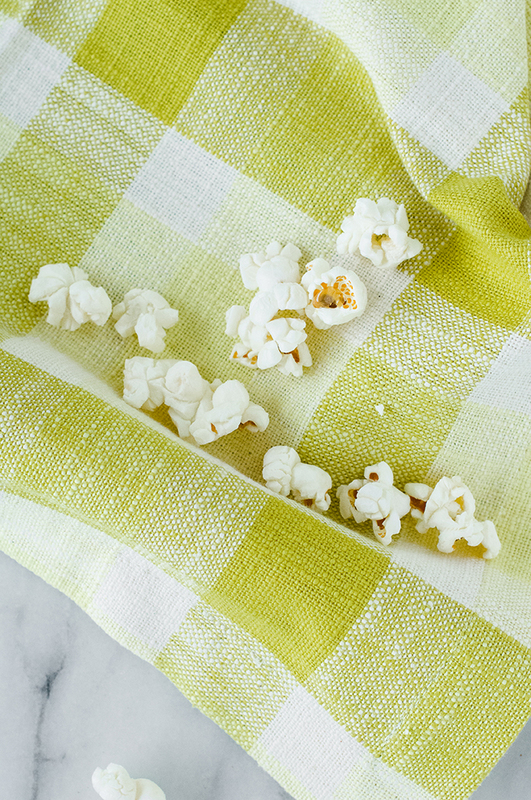 Gently sprinkle the freshly-popped popcorn with a little salt and shake the bowl or stir with a spoon. 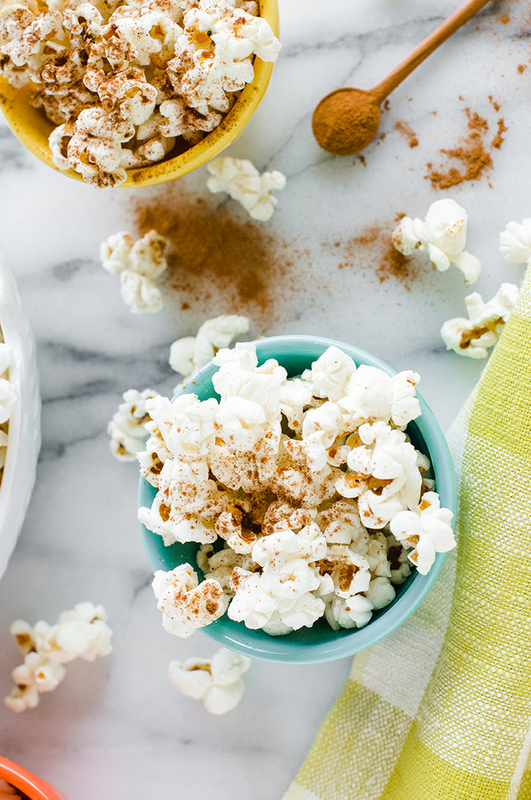 In a small bowl, mix 1/4 cup sugar with a teaspoon of cinnamon and sprinkle over the popcorn. 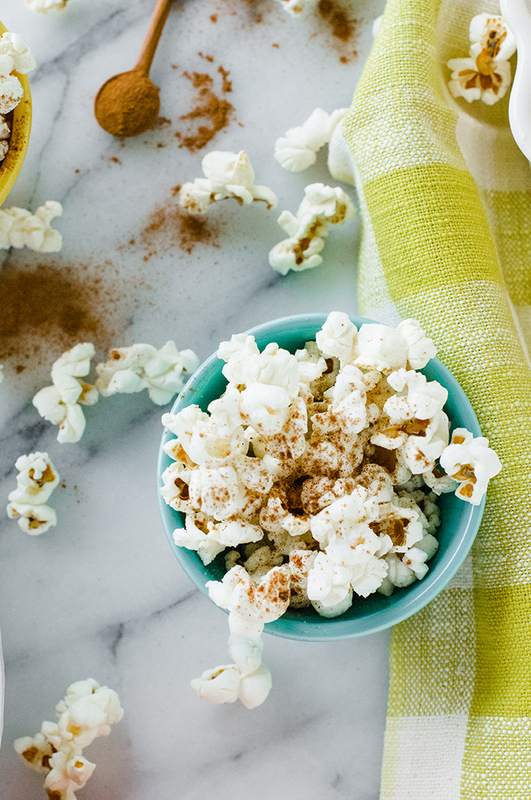 If you don’t want to mix, simply sprinkle the popcorn with salt, then sugar, then a few dashes of cinnamon. 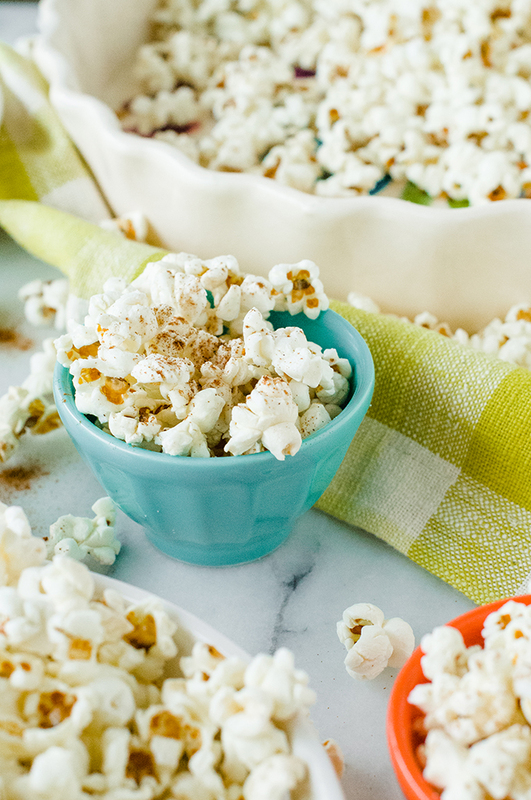 Check out some of last year’s popcorn recipes from Popcorn week like this Pop Rocks Popcorn or this Ombre Popcorn! 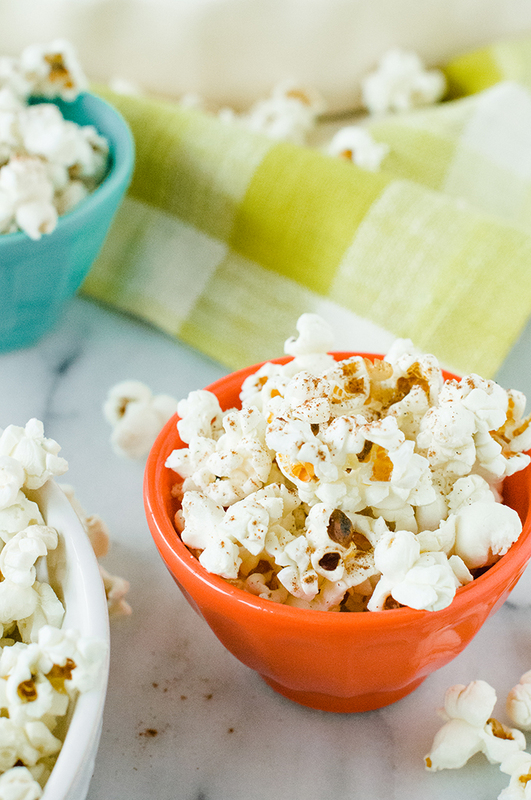 I love making this popcorn- it’s a go to snack for me! I also love the Unbreakable Kimmy Schmidt. First episode I wasn’t sure, but then I was hooked. I feel like I should go rewatch the whole season to catch hilarious one-liners that I missed! 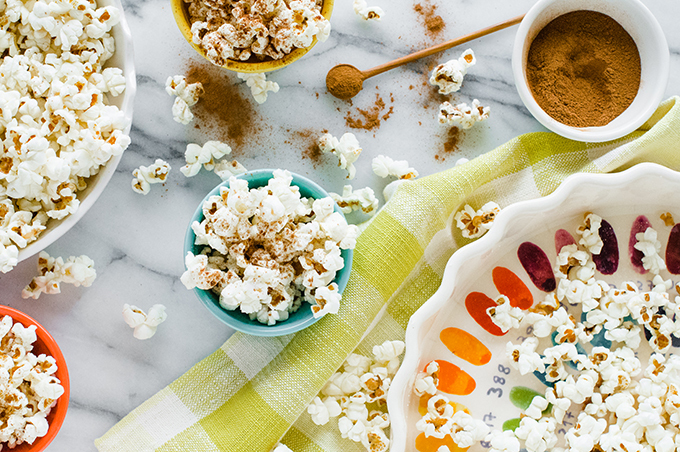 Love popcorn and I definitely am craving this to snack on after seeing the images. Love the coconut and cinnamon flavour combo! 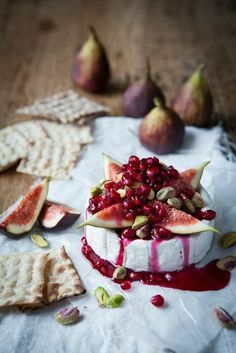 This popcorn post popped up on my pinterest feed and I need to know more about the plate – looks like a DIY but not sure where to find on your site. Thanks, Jen! Yes! It’s a total summer/fall combo! And totally tasty!